Roll Up... Roll Up... It's The Thrill Factor! Young jockey Dansile Wana thrilled the Kenilworth faithful Saturday when he piloted the Backworth-bred Windrush filly, Thrill Factor, to an exhilirating victory over 1000m for trainer Riaan Van Reenen and owners Gorgulho and Van Huyssteen. 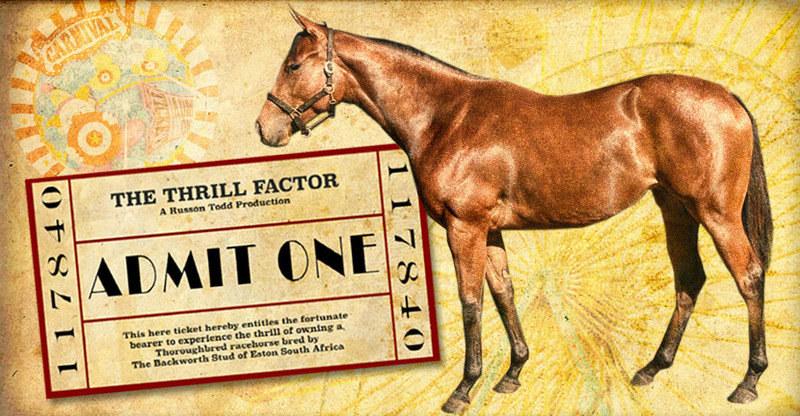 Thrill Factor is a 2012 Emperors Palace National Yearling Sales graduate out of our US-bred mare Auburn Annio who is a daughter of Southern Spring who Champion 2-Year-Old, Champion 3-Year-Old and Champion Older Mare in Argentina. With two thirds, a second and a now first from just seven starts, her connections will certainly be buckling up for the ride!